First two photos courtesy of Pam Gooch; third photo courtesy of Nathan Bell. 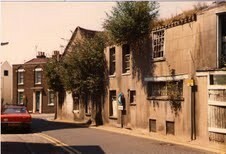 The top photo (taken in 1984) shows Horners Corner, looking down from East Street, prior to its being restored. 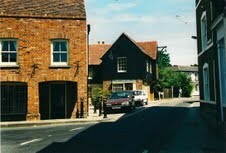 The second photo, looking upwards from South Street, shows Horners Corner as it is today. 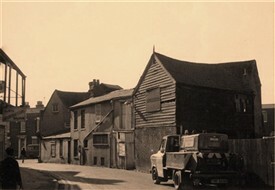 The third photo is probably from the 1960s and shows a view down East Street to Horners Corner, with South Street beyond. This page was added by Helen Barnard on 03/04/2012. In the third photo of Horners, this used to be called the slaughter house, it was right opposite from my grandfather's cobblers shop at 6 East street. When I was a little boy growing up in Rochford, Horner's was a working butchers shop with an abattoir at the back. They bought the animals from the market in The Square and took then to the holding pens in Quys Lane (opposite large green doors at side of Horner's in East St). They then brought the animals down when they were ready to slaughter them. As I grew older, I rented a garge in Quys Lane right opposite the holding pens and the animals used to look over the wall with a look on their faces that showed they knew their fate !!!!. Sad, but fact of life. facing to North Street, excepting plastered south gable. Red brick first floor, tiled ground floor to South Street. Plastered brick to East Street. Red plain tiled roofs, that to northern block of East Street range derelict at time of re-survey. 2 rear chimney stacks to North Street face, left end stack to East Street. North Street face, the northern 3 storey block with 2 window range of small paned vertically sliding sashes, gauged brick arches. 4 panel door to right, fanlight over, gauged brick arch. The southern block of 2 storeys and attics, coping to right and left gables and central parapet. Gabled lucam to central roof, now weatherboarded. 2-light window to right gable attic. 1:1:0 first floor small paned vertically sliding sashes, gauged brick arches. 1:2:O ground floor windows boarded at time of re-survey, gauged brick arches to the 2 left windows, fluted pilasters, moulded frieze and flat canopy to right window. Simple surround to 4-panelled door between the left windows. South Street face. Red brick parapet, 3 first floor vertically sliding sashes with horns, segmental arches tiled ground floor shop front, left and right doors with attached inner shop windows, all now boarded, fascias over. East Street face. A single storey link building now completely boarded is attached to the 2 storey northern block, now with roof missing. Dentilled cornice, 3 first floor small paned windows. A small square off centre left and a long rectangular window with timber lintel to right. Simple doorway to left, all now boarded. 2 square pierced metal grilles below long window.